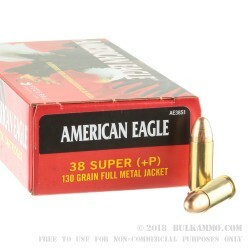 A fantastic all-around shooter grade ammunition for the .38 super allows you some great range time with your regular shooter without having to pay for super premium ammunition. The added versatility of the load gives you a solid basis for plinking with your favorite gun at a reasonable price. 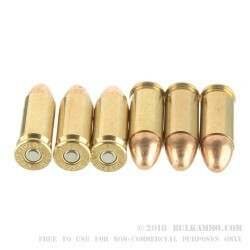 A good load with a full metal jacket round nose projectile facilitates easy loading into the chamber of your gun. The load offers a +P increase in potency to help cycle heavy springs and gives excellent performance at the range. A 130 grain projectile offers good recoil control while still maintaining the pop that is inherent to the .38 Super. Reliable feeding and extraction due to high quality brass casing and a full metal jacket, this round offers consistency and good value. 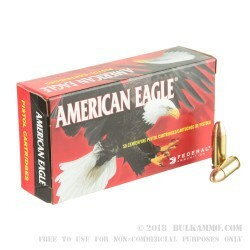 Federal American Eagle is an excellent budget conscious ammunition choice with high reliability, good power and opportunity for reloading. Boxer primed; brass case and a FMJ (“total metal jacket”) projectile. 1200 FPS velocity at muzzle and 416 ft. lbs of energy. Boxer primed, brass case; packaged in a box of 50 with a plastic insert. 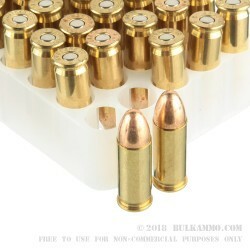 This round is suitable for mainstream builds of “.38 Super” marked modern firearms.